NONE OF US knows what he is like in private, but in his public life, Jeremy Maclin has never lacked in confidence. In media Q&A sessions, he routinely rejects any negative parts of the questions and is almost combatively positive in his answers. So, when you ask him about the theory that people recovering from serious knee injuries and surgeries often aren't fully back to health in their first year, he says with a smiling defiance, "Luckily for me, a year will be right at the start of training camp." The confidence in Maclin does not just come wrapped in words. In the most significant financial decision of his young professional life, Maclin chose this offseason to sign a 1-year contract rather than the 5-year deal that the Eagles were offering. Coming off the ACL injury suffered last year in training camp, and the surgery to repair it, he was sure enough in his physical recovery, and in his potential as a receiver in Chip Kelly's offense, to take the short-term deal in the hopes of signing a long-term extension at bigger money after he gets on the field. He walks it, he talks it, and now Maclin is running it again. "Doing everything," Kelly said. "Full go. Been in every drill." In the coming months, against real competition, we will find out how healthy Maclin really is, and how productive he can be. So far, so good - he looked fine running around at yesterday's OTA - but the real tests are in the future, as everyone knows. In the year 1 AD - After DeSean - all eyes will be on that knee, and on that player. To compare Maclin and DeSean Jackson misses the point here. Jackson is faster and has put up gaudier numbers. Maclin has a physically sturdier build and is better in traffic and in the red zone. Maclin had a very productive first four seasons with Andy Reid as his coach, and you can see how he might fit into Kelly's scheme. But until we see it, we're just conversing. As Maclin said, "I had all last season to get into the playbook and learn the offense. I'm not behind on that aspect. But it's different. You obviously don't know what you're getting into until you get on the football field." He says the offense will be productive without Jackson. He says the pieces are in place to make it go. There are no ifs when Maclin talks about this. Again, the confidence is what he carries, and now we will see how far it can carry him. 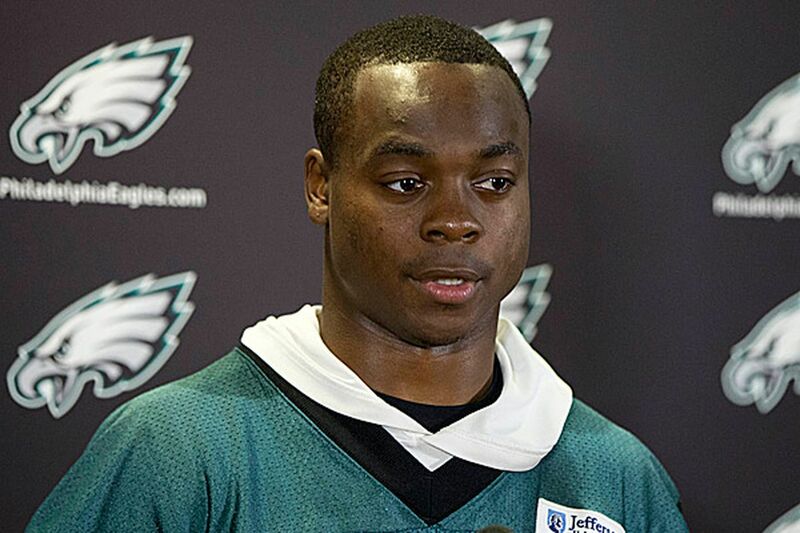 "To consider this the best year of my career, [I need] to help this team win," Maclin said. "I want to get farther than where we were last year and I plan on being a big part of this offense. "If we have the success that I think that we can have and we can get where I think we can get to, I think the stats will come. I'm not going to hang my head on certain stats or certain numbers. I'm just going to go out there and play football and do what my team asks me to do." So far, what they want him to do is practice and stay healthy. So far, so good. Reporters watching the workouts cannot tell anything but the obvious - who is playing with whom, and who is hurt, and how loud the music is or isn't. Within those parameters, Maclin ran around and looked good doing it. "Mac's doing fantastic," Kelly said, before yesterday's third OTA session, the first that was was opened to the media. "One of the things I loved about all three of those guys [Maclin, receiver Arrelious Benn and linebacker Jason Phillips all are coming off ACL injuries] is every single day in the offseason last year, or in-season last year, they were here, we have them. They got right to it immediately after the surgery. All three guys are cleared, full go out there. You'll see them running around. And Mac's doing a really good job, just getting back familiar with it. "I was really excited about how he would fit into what we do because of what he can do. And then to lose him that early in camp was disappointing. You got a taste of him. But having him out there full speed running out there right now, he's doing a really good job." The rehab has been a months-long process. Talking about it, he was asked if there had been a single moment, or a memorable workout, that convinced him that everything was going to be all right. Maclin said that it doesn't work that way. Instead, one workout builds upon another, and upon another - and from that, a confident momentum grows. "And once you build confidence," he said, "I think the rest is just putting in the work."